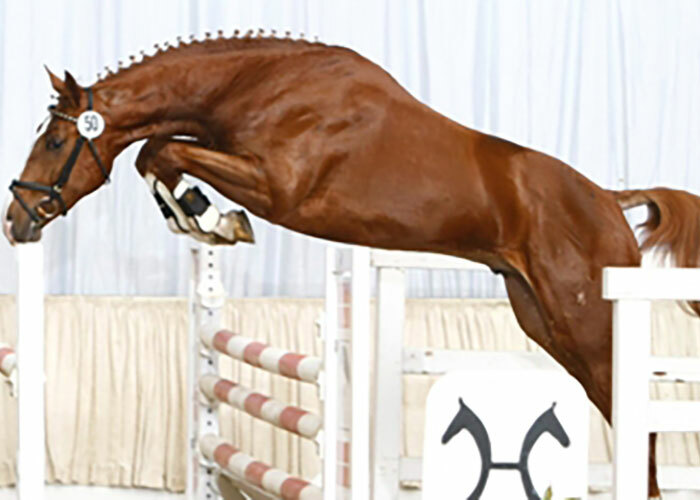 After a series of wins and high placings in the young horse tests, Hochadel won the 2003 Stallion Performance Test in Adelheidsdorf earning a perfect score of 10 for rideability. In 2004, he won the Hadelm Riding Horse Prize, and he has since become highly regarded as a sire having produced the licensed sons Hohenzollern, High Crusador, and Hochstern along with the 2010 Bundeschampionate bronze medalist of the 5 yr. old Dressage Horses, Horatio, ridden by Dorothee Schneider. Dorothee and Horatio placed fifth at the 2011 World Championships for the 6 yr. old Dressage Horses, and they recently placed a close third at the 2012 CDI4* Peterhof Dressur Gala in the Prix St. Georges Special scoring a 72.04%. Added to this, Hochadel can boast 75 State Premium Hanoverian daughters. Hochadel’s sire, Hohenstein I had a very successful career. He was named a Premium stallion at the 1993 Trakehner Licensing in Neumunster, and in 1994, he was the Reserve Champion of his performance test. 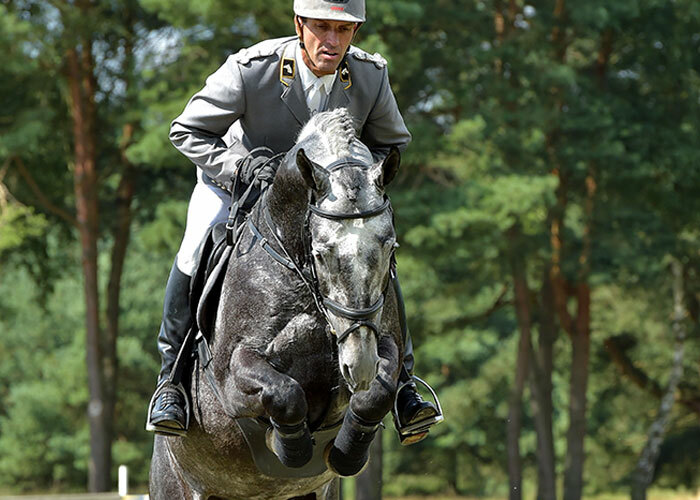 In 1995, he won the Trakehner Championship in Cologne, and won the bronze medal at the Bundeschampionate in Warendorf. At the age of 6, Hohenstein won at M Level in dressage, and went on to the advanced S Level mastering Grand Prix. 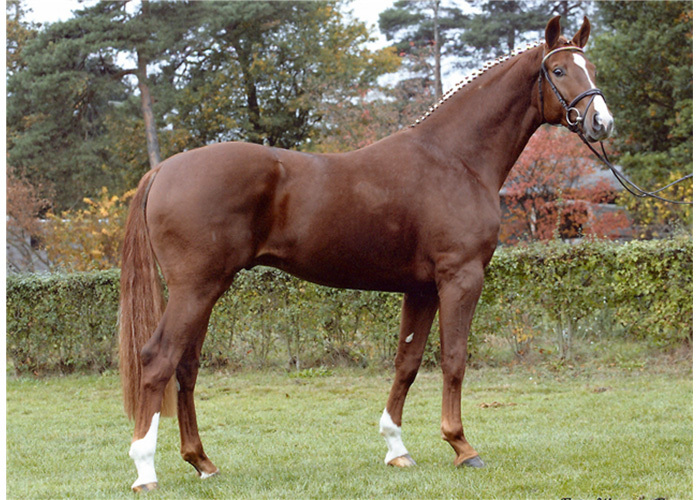 Aside from Hochadel, Hohenstein was the sire of many approved sons including Harvard, Hero, Hudson, His Highness, I Punkt, Tambour, and the Trakehner Licensing Champion, Munchhausen TSF. In 1999, the Trakehner Association named Hohenstein as an Elite Stallion, and in 2002 he was the Trakehner Stallion of the Year. Hochadel’s damline is also impressive boasting the legendary sire, Donnerhall, along with the lines of Lugano II, Woermann, Goetz, and Lugano I. The success of Donnerhall not only as an international Grand Prix horse, but as one of the most successful dressage sires of all time is well known. The sires Lugano II and his full brother, Lugano I are also tremendous. Lugano II’s son, Lungau was the damsire of 4 Olympic horses at the Sydney Olympic Games. The jumper horse, Seven Up, and the dressage horses Brentina and Barclay, as well as the dressage gold medalist, Salinero all had Lungau as their damsire. Hochadel is well known for improving type. He has 8 licensed sons, 75 state premium mares, 146 auction horses.